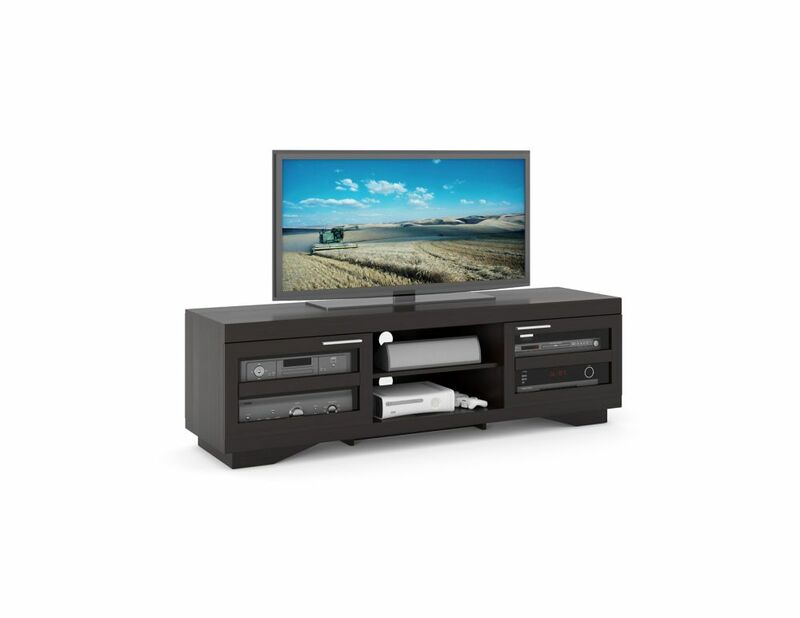 Admire the elegant modern design in the new TV Bench from the Lakewood Collection by CorLiving. This low profile bench is featured in our Dark Wenge finish accented with imitation nickel handles, includes 2 drawers and an open centre shelf. Offering a variety of open and concealed storage makes it the perfect solution for a sleek appearance. This modern bench can accommodate most TVs up to 60". Easy to assemble so you'll be set up in no time. The Liberty 62.99 Mid-Century Modern TV Stand is a high quality, beautifully crafted, functional unit. Featuring two open shelves, and one large concealed compartment perfect for stashing DVDs, board games, electronics, and media accessories, this entertainment center is the ultimate gathering place and will create a statement in any space. Artful grooves mix well with any decor and splayed wooden legs add character and ease for moving. B-007-RGT Granville 66" Mocha Black Wood Veneer TV Bench Add a sleek contemporary look to your home theatre display with this new extra wide TV bench from the Granville Collection. Sliding tempered glass doors framed with a Mocha Black wood veneer offer the perfect stage for up to an 80 TV while providing the ideal space to safely conceal your components and accessories. Beautiful brushed aluminum hardware and spacious open shelves make this extra wide design the perfect way to sit down and enjoy your flat screen TV and home entertainment system. Maximize your living space with the versatility of both open and closed storage and make the ideal choice for entertainment.